Franklin County Commissioners recognized the Governor’s Medallion Award winner Mr. Jim Grove, a recipient of one of the states top honors for volunteer service for his years of commitment and volunteerism at Safe Space, Inc. Safe Space Executive Director, Monica McInnis, MSW presented Mr. Grove with the Governor’s Medallion Award. 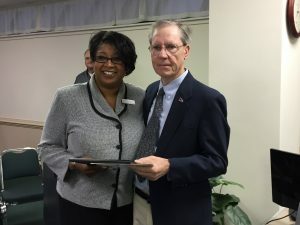 Since the doors of Safe Space opened in 1995, Mr. Grove has been a paramount figure in ensuring the victim’s of domestic violence and sexual assault in Franklin County and surrounding areas received the services and support that they needed. Thank you Mr. Grove for dedicating over 20 years of your life to making a difference and giving a voice to victims of domestic violence and sexual assault and working toward our great mission at Safe Space.